At The Game Awards, Nintendo had the spotlight the whole night and took advantage of the opportunity to announce a few of their now most anticipated games for the Wii U. Nintendo designer Shigeru Miyamoto spoke to the crowd through a pre-recorded video and dove back in time to bring us the nostalgia of the old Nintendo games, specifically Super Mario Bros. Next year it will have been thirty years since its creation and what better way then to announce another Mario game, Mario Maker. 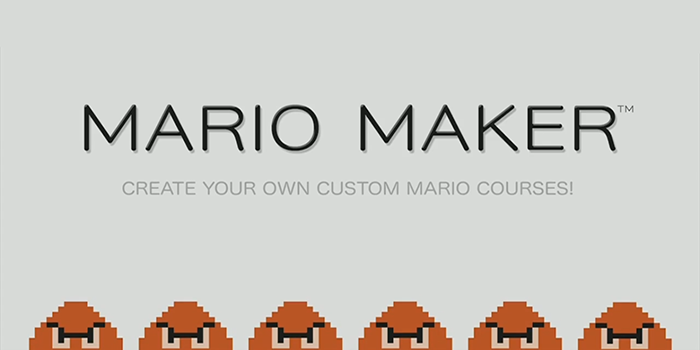 Mario Maker isn't just another Mario game, it's your Mario game. Using the Wii U Game Pad, players can design and create their own levels they way they want. Each level can be created before or during gameplay. Using the simple editing tools, players can completely redesign their world by adding in walls and pipes or making the cannons shoot out coins instead of cannonballs. Probably the best part of the game is that it allows you to switch between all variations of Super Mario Bros. games allowing you to choose to play in the classic retro design or the polished 3D look. What worlds will you create? During The Game Awards, we got to see Shigeru Miyamoto and Eiji Aonuma demonstrate another game set for 2015, The Legend of Zelda Wii U. They showed off the graphics of the game by bringing Link to a cliff that overlooked the vast valley and mountain range being touched by a setting sun. One of the cool features is that when riding Link's horse, is that Epona will mostly be able to ride without too much input from the player allowing you to swing your sword or fire an arrow. Jumping in the air off your horse will slow down time creating a window for you to carefully aim at your target before you hit the ground. At the end of this video, the two started talking about how the controls for the new Star Fox game were coming along great with the Game Pad. They didn't give an exact date for its release, but they did mention that Star Fox will be out sometime before The Legend of Zelda Wii U.